Schutzhund (now known a IPO) is German for Protection Dog! This dog sport derived from Germany and designed to evaluate a dog's character rather than simply evaluating the dogs appearance for breeding. Many breeds train for the IPO titles but the tests are demanding on the dog's ability to work under stress. Before a dog can compete in IPO, it must pass a BH temperament test. This tests the dog's basic obedience and sureness around strange people, dogs, traffic and loud noises. A dog that exhibits excessive fear, distractibility or aggression will not pass the BH and thus cannot attempt the IPO titles. There are three IPO titles - IPO I, IPO II, IPO III and each title consists of three phases: obedience, tracking and protection. Each phase is summarised below. The tracking phase of each title includes a temperament test. The dog is closely examined by the judge for stability and impartiality i.e. neither hostile or fearful of strangers. The track is laid earlier by a person walking normally on a natural surface such as dirt or grass. The track is aged at least 25 minutes, includes a number of turns and small man-made objects dropped by the person laying the track. At the end of a 30 foot line, the handler follows the dog, which is expected to scent the track and indicate the location of the objects. The tracking phase is intended to test the dog's trainability and ability to scent, as well as, its mental and physical endurance. The complexity varies for each title. Various heeling exercises are performed in isolation and then amongst a group of people. Gun shots are fired to test stability. 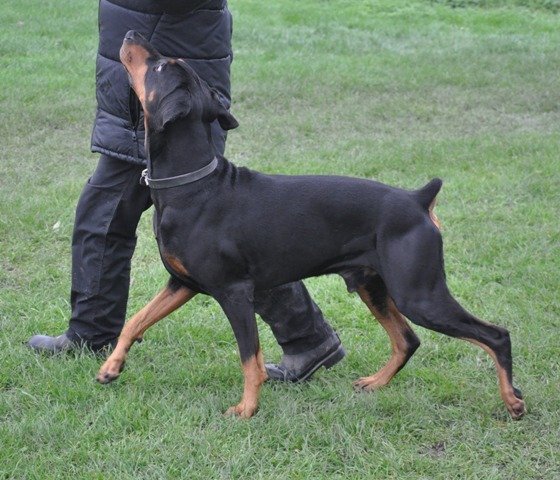 During these heeling exercises the dog is commanded to sit, lie down and stand out of motion i.e. while the handler continues to move forward. 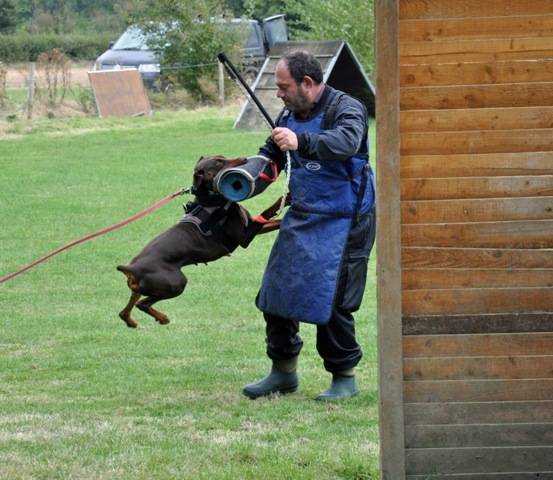 Recall to handler is performed from the various positions. 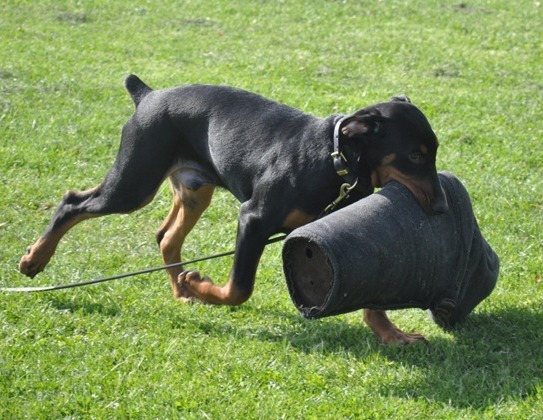 With dumbbells of various weights, the dog is required to retrieve on a flat surface, over a one-meter hurdle and over a six-foot 'A' frame. The dog is also asked to run in a straight direction away from its handler on command and lie down on a second command. 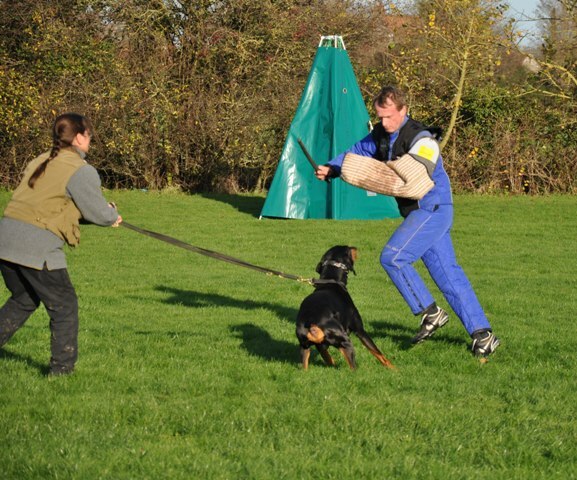 Each dog is expected to remain in a down position away from its handler at the other end of the obedience field while another dog and handler team completes the above exercises. This phase of training is intricate, advanced and taught with control in mind. It should NOT be confused or compared with guard dog or police protection training. A dog competing in the sport of IPO must always prove to have a reliable temperament and will not show any aggression. 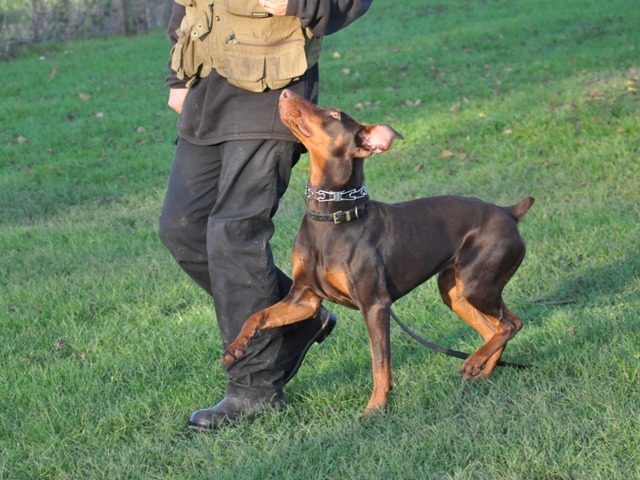 The protection phase tests the dog's courage, physical strength and agility. The handler's control of the dog is absolutely essential. The exercises include a search of hiding places, finding a hidden person (the decoy) and guarding that decoy until the handler approaches. The dog is expected to pursue if the decoy attempts an escape. The decoy is searched and transported to the judge. 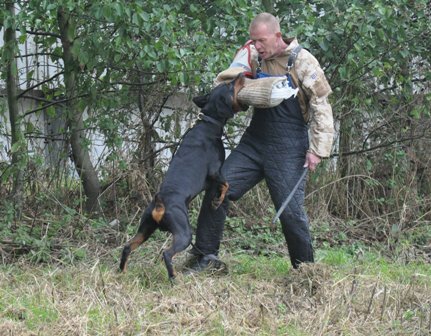 When the decoy tries to attack the handler, the dog is expected to stop the decoy with a firm grip and without hesitation. The final test of courage occurs when the decoy is asked to come out of a hiding place by the judge from the opposite end of the trial field. 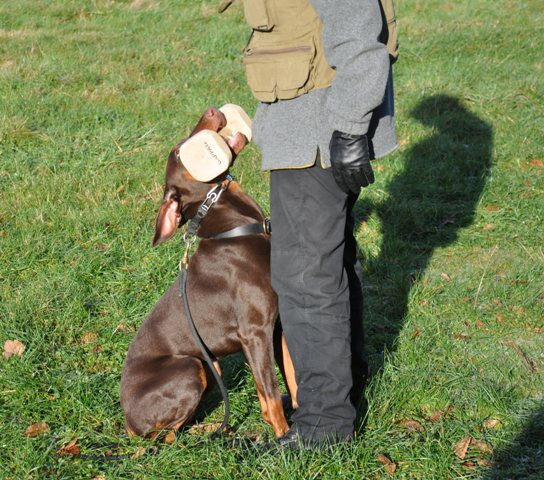 The dog is sent after the decoy when the decoy refuses to listen to the handler's command to stop. The decoy then runs directly at the dog threatening the dog with a stick. All grips during the protection phase are expected to be firmly placed on the padded sleeve and stopped on command and or when the decoy discontinues the fight. The protection tests are intended to assure that the dog is neither a coward nor a criminal menace. If you would like to train with us please compete our contact form or send an email with your name & contact details to Chris or call: 07765 047700 if you wish to talk to somebody instead!